"My faith and understanding have grown since being introduced to the Adult Forum. No matter where you are in your faith journey, I think you will find the one-hour (forum) informative, strengthening, and enjoyable." P. A. 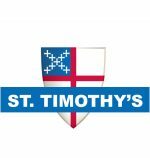 What Christian Education does St. Timothy’s offer for adults? St. Timothy’s Adult Forum is part of Christian Education exploring a historical perspective, outside examination and better understanding of the Bible bringing you to a stronger relationship with God. We encourage interaction and reflect of diverse opinions in a relaxed, non-judgmental environment. The Adult Forum “Venture” series concludes with this six-week unit entitled, “Glory to God: Seeing the Holy in the Power of Art.” We’ll use Jeremy Begbie’s Beholding the Glory: Incarnation through the Arts (Baker, 2001) as the primary source book from which weekly discussions will emerge. New, used and Kindle versions of the book are available on Amazon. Study guides for the series are available from Fr. Jeff.